Ever wish your kids would magically jump off the couch, turn off the TV, and run outside to play for an hour? If so, Switch2Health can help. 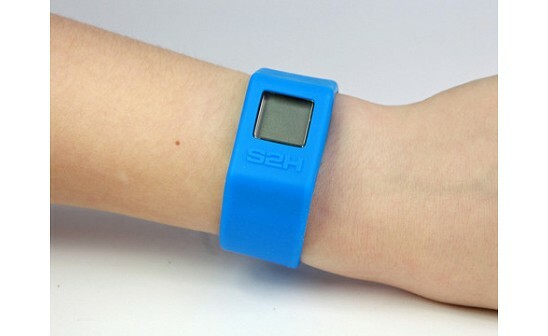 The company’s S2H Replay wristbands monitor physical activity, and the wearer can earn rewards ranging from a free phone ringtone to an Xbox 360. Founders Seth Tropper and Amado Batour developed the wristbands to help combat the obesity epidemic, which stems in part from a lack of exercise, especially among children. According to a study done by the American Academy of Pediatrics, 30% of children in the U.S. are obese. Because overweight children are much more likely to become overweight adults, parents who encourage healthy habits in their children can help to prevent some serious health issues in the future. To earn points, the wearer has to engage in physical activity for one hour. The bands check every three minutes for moderate to active motion, such as jogging, running, playing tennis, soccer, basketball, or running around at school. Each segment of activity gets recorded and counts toward the one-hour goal per day. Once that goal is reached, the band generates a unique code that you can enter into the website to accumulate points toward a reward — such as a gift card to a major retailer, a Wii console, or an iPod. Tom Castaldi told us about this fun, simple way to motivate children and adults to exercise. The payoff is refreshingly clear: Choose a healthy lifestyle, and you’ll reap the rewards — physical and material. My name is Amado, the co-founder of Switch2Health (S2H); I’m ready to answer any questions you might have about the S2H REPLAY and S2H.COM. We’re super excited about having our product featured on the Daily Grommet, and we hope that everyone who checks out the S2H REPLAY will see how we can ALL benefit, kids AND adults, from living a healthier lifestyle. 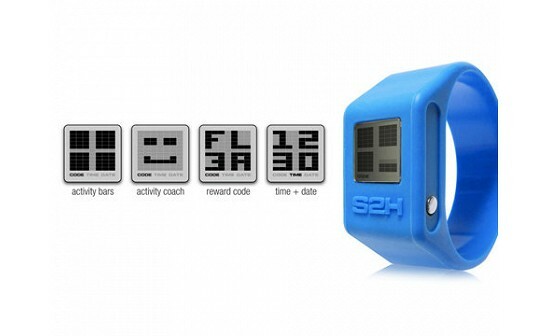 At S2H we say, BE ACTIVE, GET REWARDS! 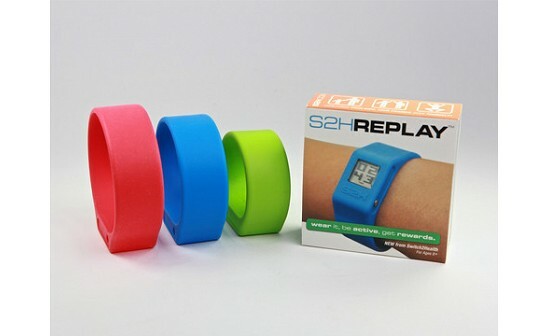 I have to admit I had to show this Grommet in advance to my son and he is excited to be able to order his S2H replay band. He is so motivated by the rewards offered that I have no doubt he will choose to be active over inactive for a long time to come! I could really benefit from this band as well! If you are still unsure...you can click here to open a .pdf to print that has a guide you can cut out and use to measure your wrist. At S2H, we're working with national and local sponsors that want to reward their customers for being physically active. We're building an amazing collection of rewards that kids AND adults will find attractive, so your S2H REPLAY will keep on rewarding you for your activity! Awesome concept! May this product help change a whole generation of children. Out of all of the grommets I have seen on this site, this one is among the best. I LOVE my Replay. It's definitely not just for kids (although the neighbor kids frequently ask to wear mine and run around the yard to fill the bars!). As a relatively new runner, I find that the "carrot" of filling the bars keeps me moving; I'll even run a few extra blocks just to get my next code. Pre-Replay, I would find any reason to quit. Running my first 10K next month, which is a minor miracle! Also, S2H customer service is fantastic, and they're quick to answer any and all questions. Jason - We think this is the next gen LiveStrong band...everyone can wear this, from the boardroom to the schoolyard. Not only does it represent a healthy active lifestyle, but it shows that you are earning real value for you healthy activity. This can be a powerful incentive. Since I got my own pedometer 2 months ago, it has become my new best friend with constant feedback for my efforts.... or lack thereof. Feedback is even better than an XBox! I love this and will recommend it to friends who are coveting my pedometer. Love it! Definitely motivates me to push through that last mile to fill up bars. One question though, how long does the battery last? This was a great gift for my sister who's already a serious runner. It's the gift that keeps on giving. Our 9 year old granddaughter is a gymnast and already exercising more than 15 hours a week. I guess it's not cheating to reward that? Margaret - Absolutely! your granddaughter deserves to be rewarded for her physical activity. Kat - Your sister would definitely love the S2H REPLAY! Is it waterproof? What if the exercise is swimming? Is there a monthly fee associated with this? Who pays for the prizes? Dan - The S2H REPLAY can be worn in the pool, you can take a shower with it on, but you cannot go diving with it. sg - The only cost to the customer is the $19.95 for the S2H REPLAY, there are no additional charges at all. We have many sponsors that pay and offer the rewards; we're constantly building our rewards partners and catalog, so you should always check out to see what's new. Thanks! This sounds great. Does it work with walking? Hi, we printed out the measuring guide to determine the appropriate size for my kids, and now we're confused. The guide measures the wrist size, yet the instructions say that the band should fit over the knuckles. Is the band flexible enough so that if you size it for your wrist, it will stretch to fit over the knuckles? Or should we really be measuring the circumference of the hand at the knuckles to determine the correct size? Thanks! Dee - The S2H REPLAY works with a brisk walk with good arm movement, a casual walk will not register. Frank - The material of the S2H REPLAY is made of silicone rubber, the same stuff that the LiveStrong bands were made of. You can stretch an S2H REPLAY band to almost twice its size, so definitely measure around the wrist. Thanks! Hi Frank! This looks very exciting and motivating. I have bad knees and need to do low impact exercises. Would it register movement on an eliptical or bike or on exercise videos like Wii Fit or Wii Active? Thanks! Is there a fee connected to get an account before you actually get the "free" rewards? Or are the rewards really, really free? Sue, although we say the S2H REPLAY needs moderate to intense physical activity, I've been using the product for over 9 months now and I can tell you that playing Wii does fill it, most likely the elliptical will fill as well. Frank, the $19.95 gets you a device good for how long? What is the cost to renovate? Great concept! Does the wristband store information if you're between reward levels? If so, for how long? My kids would be disappointed to 'lose' rewards if they're not active (enough) every day. @Anna - For each 60 minutes of activity you receive a code. You log that code in at their website to earn 60 reward points. 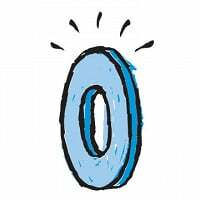 Those points don't expire, so if your kids stop wearing their band for a period of time, they can still come back at a later point and pick up earning rewards where they left off! If you do 30 min one day, and 30 the next, do you receive a code? Or is it 60 min of activity within a 24 hour period? midnight to midnight? You are right -- my kids come home at the end of the day and they tell me if they only need a few more bars. They want to eat dinner quickly and then run outside playing to reach a code that night. The kids get into this and if they don't earn a code on one day, they can make up for it the next day (or do jumping jacks before going to bed). If you earn one code and then complete enough activities to earn a second one before you have the opportunity to input the first code, will the device store both codes until you get a chance to input them? @Reesa, great question! You need to input the code and reset the monitor for it to start measuring your activity again. Hi Reesa -- When you reset the monitor/module, you lose the code and are starting over. So, you should enter your code or write it down to enter later before you reset. Is the s2h replay available in stores or only online through this website? @Gail - it is not yet in stores. @Amanda, I've forwarded your note to Amado who will be able to help you with this. Thank you for posting! Hello, I got the bar working now and finally got a code after doubling the exercises. I have resetted it and now it's not working again. Is there any way I can get a replacement? @Amanda - absolutely! I e-mailed you earlier at the address you used to post. I am going to re-send it in case you did not receive it. Thank you so much. I replied to the email. Sorry I didn't see it earlier. Thanks again! I just started a fitness program this month and I know that external motivators work very well for me. This seems like an ideal product to keep me working toward my goals. I plan on bicycling as a large percentage of my workouts. Will the Replay record cycling? Is the band flexible enough to be worn on my ankle (10") or would the band (or my ankle) be damaged? @Cara - it's a constant reminder that you have to get up and get moving. A great motivator! Congratulations on starting your fitness program. The monitor needs to be moving, so it wouldn't work on your wrist riding a bike. The band wouldn't be comfortable on your ankle, however the monitor comes out of the band so I'm sure you could do something creative with it like putting it in the cuff of your sock. @Cara - Lots of people have asked about biking...since the REPLAY is worn on the wrist, unfortunately it won't register too much movement since the wrists stay pretty stationary while biking. People have tried putting the band or the module on their sneakers/ankle with varying levels of success. If I were to think of it purely from a mechanical perspective, the knee would be the best spot, because of the up and down motion, but obviously there is no way to 'mount' the REPLAY in that position. So, at the end of the day...biking doesn't really work with the REPLAY. @Amanda - we will look into why you haven't received your replacement and get back to you. Thank you for posting! @Jolinda - thank you for the feedback, we are glad your experience was positive. We try to be very careful about the companies we feature and we really get to know the people (like Amado and Seth) behind the products and aren't surprised that they gave you good service. We are declaring an end to nameless, faceless business! We are very glad you clicked that Facebook ad as well! Welcome to the Daily Grommet community! I've had my replay for almost a month and one button already popped off and the other button doesn't work. What should I do, I love it. How can I get a replacement. @Mike - I will contact you directly. Thanks! I want this product!! I want to give it to at least 5 children in my family for Christmas (and a handful of adults as well). Any idea if it will be available before Christmas? I'm new to Daily Grommet... is there a way to sign up for an email alert when one of your out-of-stock favorites is back in stock? Thanks! @Beth Roberson: I am checking into it and will report back! @Beth Roberson: It is looking like they won't be available before January. You may have to give them Gift Certificates to Daily Grommet instead! Thanks Katherine. Appreciate your help. Happy holidays! Hi There - I have a very silly question - I just got my replay in the mail and got my first code - yay! - however I'm at work (at the wellness center) and can't recall how to reset to clear the current code so I can get to work on my new one! @Kait: You simply hold the two buttons at the same time for a few seconds. Are the gift certificates only able to purchase products from the store's online store/website or can we also use the gift certificates at the stores? @Anne: Daily Grommet Gift Certificates can only be used for purchases made at dailygrommet.com. I probably missed it in plain sight, but I cannot find the price for this item. Please help. @Grace: Just to the right of the video on a feature's main page is the shopping box. When you click on the 'Choose an Option' dropdown you will see the prices for all of the items featured. @Toni Slowinski: I will forward your information to customer service who will be in contact with you directly. I got my purchase in the mail the other day. It's really cool and works perfectly! I do however, have two suggestions. The sizes really aren't described very clearly. I'm a 5ft8, 29 yrs old woman who is far franthony, the large which was described for an "adult" so that's what I ordered. Problem is, it's SO big it falls right off me. I think the descriptions should be a bit more specific, maybe even with inches listed or a printable measuring tape available so people can order the correct size. Also, after registering my product on S2H.com, I see the replacement bands come in a ton of colors not available on Daily Grommet. I wish all the colors were available here. A lot of the other colors are geared a lot more towards adults (such as black, grey or white), which is most likely the target audience of members on this site. Other than these two issues, this is such a fantastic idea, and a wonderful motivation tool! Thank you! @Rachel Artz: Thank you for your feedback. We did post a link to a printable sizing chart above but it's a great idea to post it again as it can easily get lost within all of the information. We hope you have fun while earning rewards for being active! Click here to open a .pdf to print that has a guide you can cut out and use to measure your wrist. Ever wish your kids would magically jump off the couch, turn off the TV, and run outside to play for an hour? If so, Switch2Health can help. The company’s S2H Replay wristbands monitor physical activity, and the wearer can earn rewards ranging from a free phone ringtone to an Xbox 360. Founders Seth Tropper and Amado Batour developed the wristbands to help combat the obesity epidemic, which stems in part from a lack of exercise, especially among children. According to a study done by the American Academy of Pediatrics, 30% of children in the U.S. are obese. Because overweight children are much more likely to become overweight adults, parents who encourage healthy habits in their children can help to prevent some serious health issues in the future. To earn points, the wearer has to engage in physical activity for one hour. The bands check every three minutes for moderate to active motion, such as jogging, running, playing tennis, soccer, basketball, or running around at school. Each segment of activity gets recorded and counts toward the one-hour goal per day. Once that goal is reached, the band generates a unique code that you can enter into the website to accumulate points toward a reward — such as a gift card to a major retailer, a Wii console, or an iPod.